Since tobacco was brought to Europe from America, its consumption has formed a significant aspect of social life. Different methods of smoking tobacco have gone in and out of fashion and the large range of smoking accessories that have resulted are very appealing to the present-day collector. This book is told from a collectors point of view and covers pipe racks and tobacco boxes to cigar cutters and primitive lighters. These and many other smoking antiques are included as well as countless photos to aid in identification, smoking ephemera, the historical background of smoking, and much more. 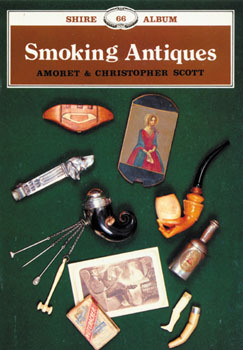 For any collector of smoking antiques and other memorabilia this valuable guide will be of great use.